We had been wanting to make madeleines for so long before we finally bought the pans and made a batch. They are one of those elegant treats that we admired from afar, but never attempted to make. They are cute, but don’t quite look worth the time to make. I mean, you might as well eat a slice of pound cake or something, right? Well, we were wrong! They were worth the wait, and we regret not having made them sooner. This particular recipe is from David Lebovitz, who knows his French desserts since he has been living in France for a while. They are surprisingly simple to make- in my opinion, the hardest part is greasing and flouring the 24 shell-shaped wells in the pans. They are elegant cakes that almost seem like they couldn’t possibly have many calories, they are so airy. The lemon flavor is just right, particularly when paired with the simple glaze (which we highly recommend, as it adds moisture to the madeleines and an extra bit of lemony punch). We added the optional baking powder to the recipe, and our madeleines turned out perfectly, so we suggest you do so as well. 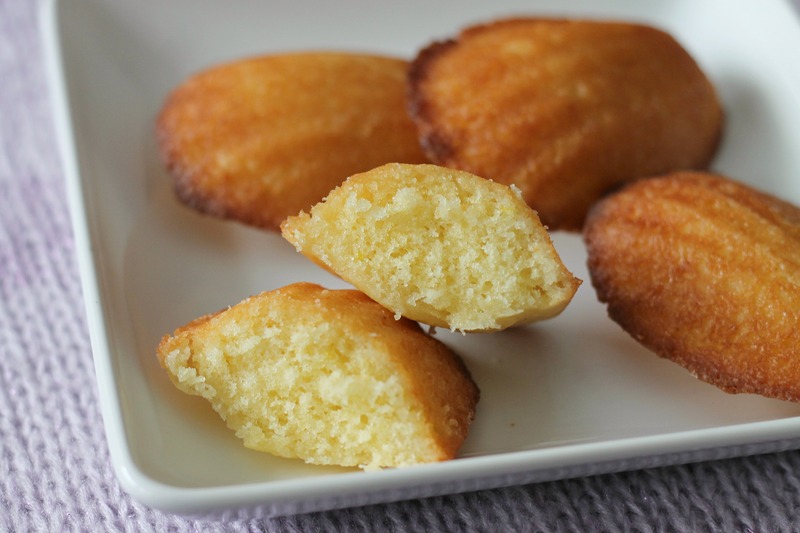 Brush the indentations of a madeleine mold with melted butter. Dust with flour, tap off excess, and place in the fridge or freezer until ready to use. In the bowl of a electric mixer, whip together the eggs, granulated sugar, and salt for 5 minutes until frothy and thickened. Spoon the flour and baking powder, if you are using it, into a sifter or mesh strainer and use a spatula to fold in the flour as you sift it over the batter (it is easiest to sift a bit, fold it in, and sift a bit more, and then fold that in). Add the lemon zest to the cooled butter and stir together, then pour the butter into the batter, a few spoonfuls at a time, while at the same time folding to incorporate the butter. Fold just until all the butter is incorporated- don’t overmix! Cover the bowl and refrigerate for 1-12 hours. To bake the madeleines, preheat the oven to 425 degrees. Divide the batter evenly between the 24 indentations. Do not spread it. Bake for 8-9 minutes or until the cakes just feel set. While the cakes are baking, make a glaze in a small mixing bowl by whisking together the powdered sugar, lemon juice, and water until smooth. 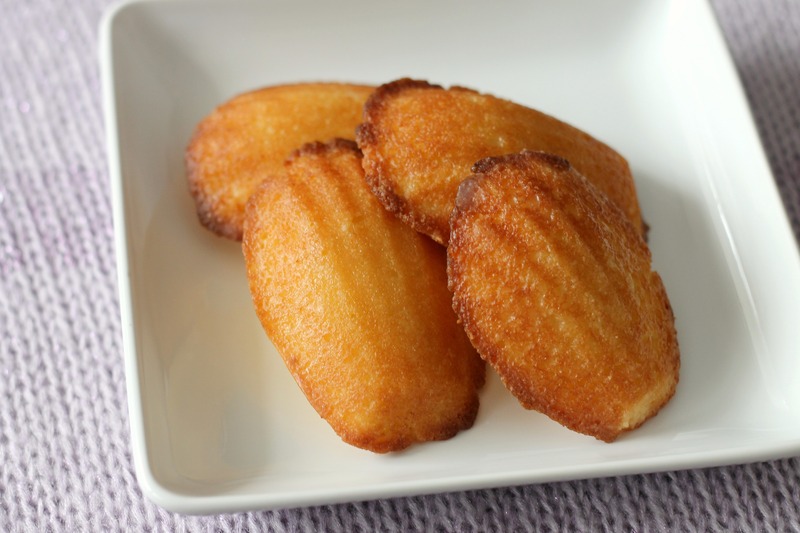 Remove from the oven and place the madeleines onto a cooling rack. Let them cool for 5 minutes, then dip each one in the glaze, turning them over to make sure both sides are coated and shake off any extra glaze. After dipping, rest each one back on the cooking rack, scalloped side up, until the cakes are fully cooled and the glaze has set. Enjoy! Note: Eat these the day they’re made- they will be freshest that way. Plus, they probably won’t last around for longer!